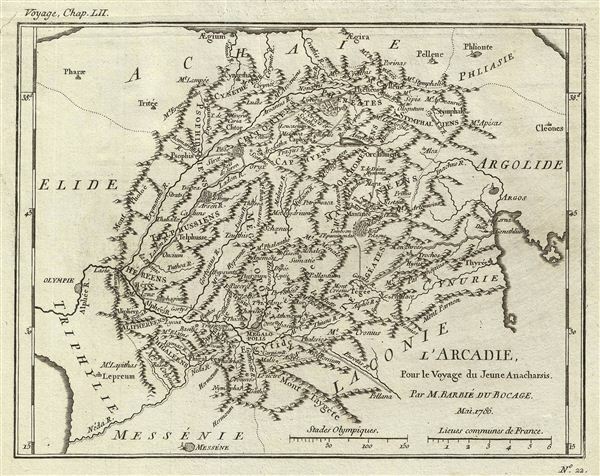 l'Arcadie, Pour le Voyage du Jeune Anacharsis. This is an attractive 1786 map of Arcadia in Ancient Greece by M. Barbie de Bocage. Bocage based this chart on an earlier map by D'Anville. Arcadia, according to Greek mythology was the home of the God Pan. It is surrounded by Achaea in the north, Argolis and Corinthia in the east and Laconia and Messenia in the south. Highly mountainous, this remote region according to Herodotus was inhabited by 'indigenous' Greeks living there before the arrival of the Hellenic tribes. Prepared by M. Barbie de Bocage in 1786 to illustrate the Travels of Anacharsis.